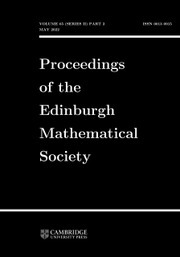 The Edinburgh Mathematical Society was founded in 1883 and over the years, has evolved into the principal society for the promotion of mathematics research in Scotland. The Society has published its Proceedings since 1884. This journal contains research papers on topics in a broad range of pure and applied mathematics, together with a number of topical book reviews.